“Tidal Basin Beach Officially Opens,” Histories of the National Mall, accessed April 22, 2019, http://mallhistory.org/items/show/211. Even before the Tidal Basin was constructed, planners proposed to use it as a recreational bathing beach. 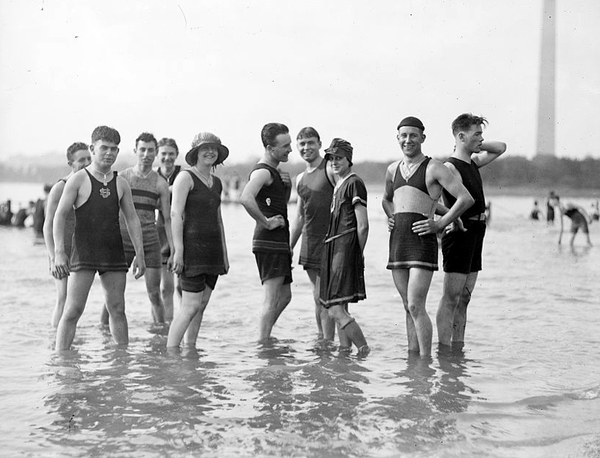 On August 24, 1918, the Tidal Basin bathing beach officially opened with a water carnival. Diving competitions, swimming competitions, and canoe tilting contests were all held for men and women. The beach remained open until the mid-1920s, when it closed due to pollution.